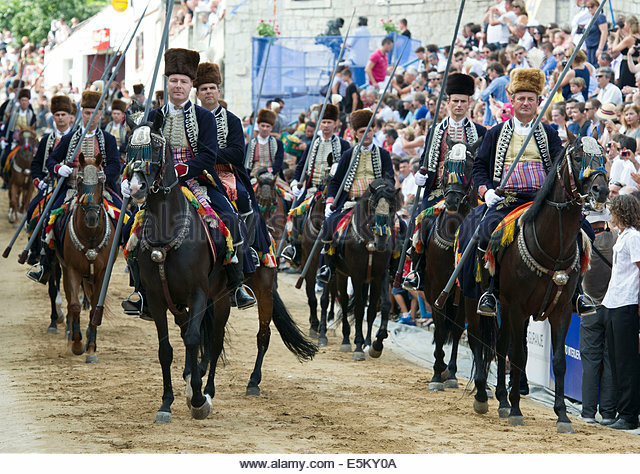 Family fun in Split 2018 – Alka Jousting Festival, experience real Croatia! Just an hours drive from Split, Sinj is famous for its annual Sinjska alka, a medieval joust that celebrates the townsfolk’s victory over the Ottomans – contestants, clad in eighteenth-century costume, gallop down a steeply sloping street at the southern end of town and attempt to thread their lances through a ring dangled from a rope. First recorded in 1715, the Alka is one of the few remaining examples of the contests that once took place in all the Adriatic towns. You will enjoy a guided tour of the town and visit the local Alka museum. For just one day a year, a riot of colour with spit roasts and local delicacies a-plenty. Tickets for the main spectator stand are hard to get hold of so early booking is recommended. All our tours are small groups only, comprising no more than 18 people.